The ever-iconic winged Gundam from Gundam Wing Endless Waltz returns in Real Grade form! The wing structure of this Wing Zero interpretation is based on application of current real world technology used in aircraft. Considerable thought has been put into heat protection and machine protection as well as design and function for an otherwise unorthodox mecha design! Even the flexible feather shaped extremities incorporate elements from thrust vectoring mechanisms of combat aircraft. Twin Buster Rifle and beam sabers included. 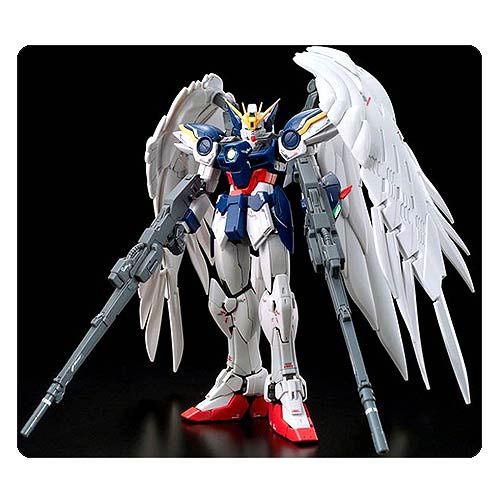 The Gundam Wing: Endless Waltz #17 Wing Gundam Zero Real Grade Model Kit measures approximately 5-inches tall. For ages 15 and up.